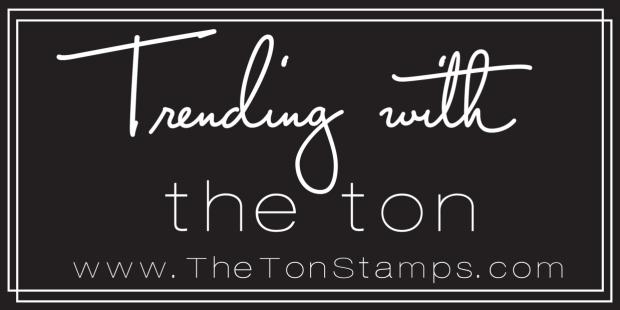 Cat Tales and Paper Trails: Gina K. Designs & CardMaker Blog Hop! 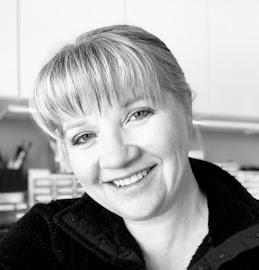 Welcome to the Gina K. Designs and Cardmaker Blog Hop! 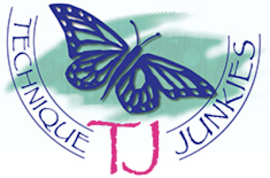 If you have reached my blog from Susie Moore's blog, welcome! You've reached the next stop. Thanks for hopping with us today. 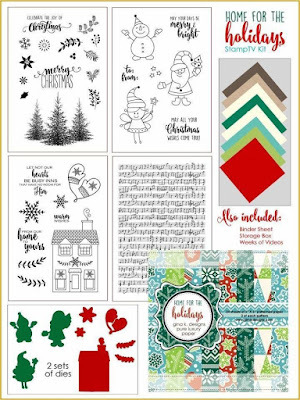 The design teams from Gina K. Designs and CardMaker have teamed up to bring you some new inspiration using the Gina K. Designs Home For The Holidays StampTV Kit. 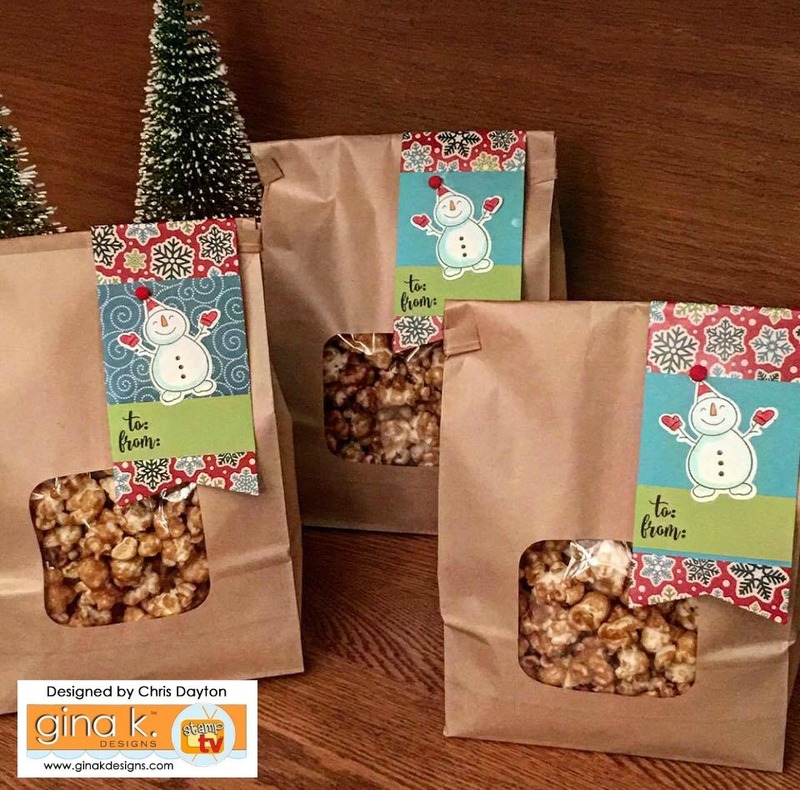 This amazing jam-packed holiday themed kit is available now from Gina K. Designs. 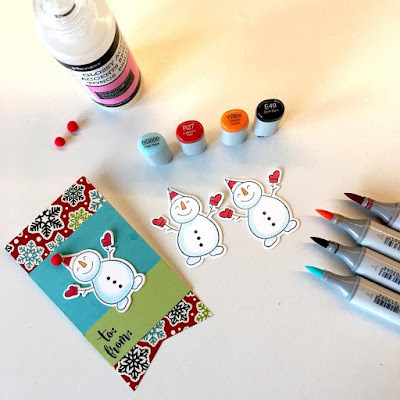 Today, I am sharing some fun gift packaging featuring the gift tags using the cute little snowman and some various paper scraps. I'm a paper hoarder. I hate to waste paper, so I have plastic drawers that I toss my various scraps of patterned papers and card stock in. This project is a good way to use up some of those scraps! 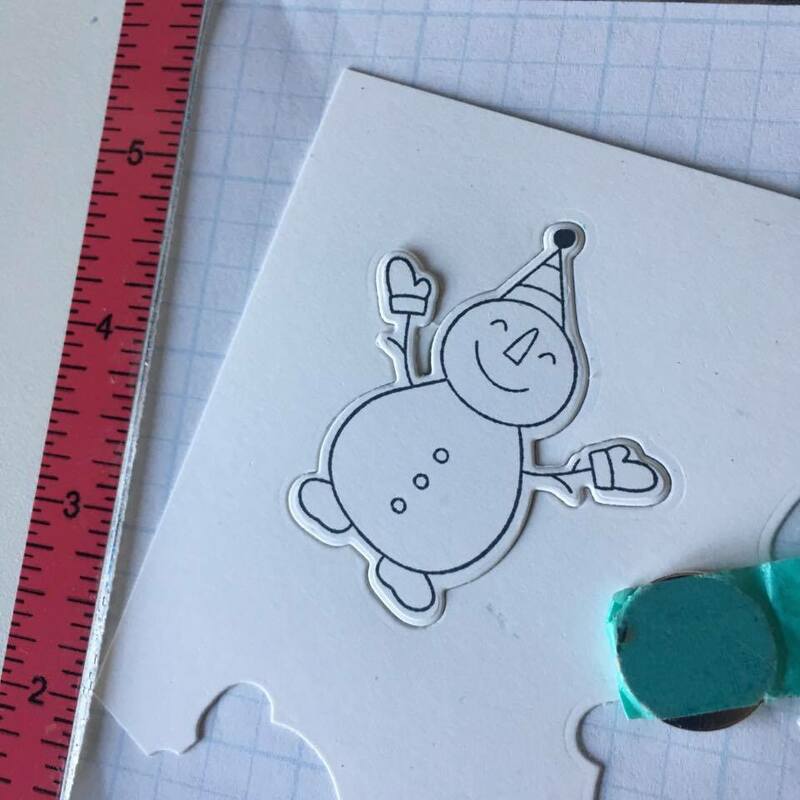 I started my project by first die-cutting a few of the snowmen from Gina K. Heavy Weight Base White card stock. I saved the negative piece from my die cutting, and used that as a guide for stamping my image. To do this, I used my MISTI. 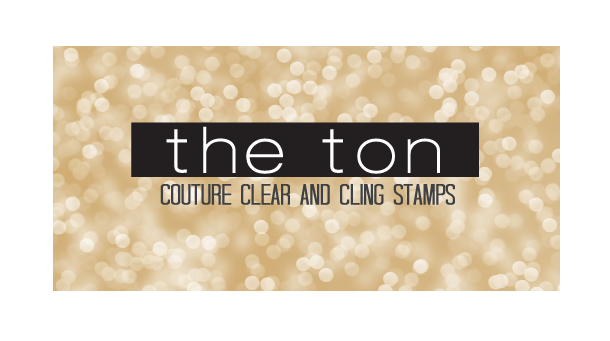 I first stamped once on a scrap paper, leaving my stamp in place on the lid. Then I centered my die cut negative over that stamped image and secured the negative in place. Next, I popped the die cut back into the negative hole. I know that it will stamp exactly as I want it to, because I know it is lined up correctly. It does. And I removed the die cut and continued stamping the remainder of my die cuts. I then very quickly added a bit of color to my snowmen and their scarves with Copic Markers. 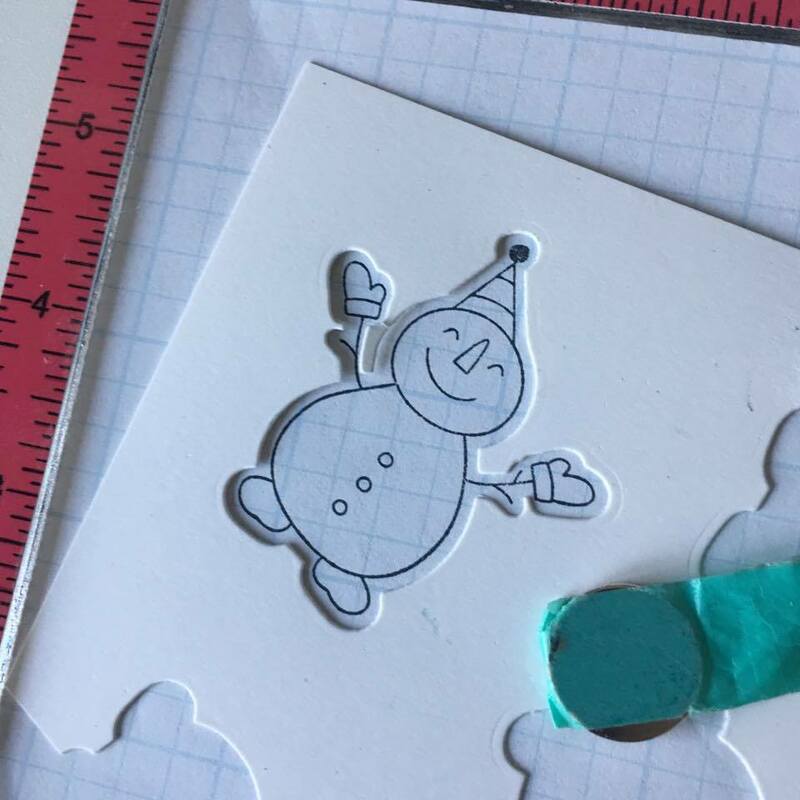 I chose to snip off the inked pom-pom from my die cut, because I would be adding a tiny craft pom-pom instead. My "tags" were made from a 2 1/2" x 5 1/2" piece of patterned paper. To create the ribbon tail edge, I marked the center point and measured 1/2' from the bottom, and marked a dot with pencil on the reverse side. And just cut from the edge to that centered dot with scissors. I used scraps of coordinating patterned paper and cardstock to create a contrasting bands on my tag. I stamped the To:/From: in Gina K Black Onyx ink and added my snowman, adding the pom-pom with Glossy Accents last. My packaging for my popcorn is a lined Kraft window coffee bag. I love giving homemade treats for the holidays, and this is always a nice simple way to gift a gift. I filled mine with homemade Caramel Corn. I make many, many batches of this popcorn each year for easy holiday gifts. Just for fun, I'm including my secret recipe in case you'd like to try it for yourself. Melt butter in saucepan. Stir in brown sugar, syrup and salt. Bring to a boil stirring constantly. Boil 5 minutes, no longer stirring. Remove from heat. Add soda and vanilla. Stir until foamy. Pour over popped corn, mixing well. Place into two large baking pans. Bake in a 250 degree oven for one hour, stirring every 15 minutes. Let cool and enjoy. Thanks for stopping by today. Your next stop on the hop should be Juliana Michaels. So adorable---love the little pompoms! Thanks for being a part of the hop! What darling gift tags. Thanks for the great details and for sharing your yummy caramel corn recipe. Love the snowman and can't wait to trey the popcorn. I just bought this kit and am loving all the great ideas you guys are posting. thanks! Oh wow, love the gift tags and thank you for the recipe to make the popcorn. Popcorn is my favorite snack! Oh my, and Caramel corn too. Lucky recipients! Cute tags! Great popcorn recipe. Thanks for sharing. What cute little bags and tags, Chris! Just adorable!!! Yummy...the great bags are a great idea! Cute packaging and a recipe to boot! Thanks. What a great idea! Loved your tags! Very cute idea....thanks for sharing ! Very cute way to give the popcorn. Awesome treat bags! You know me! I love packaging. Yummy popcorn too. Salivating! Great tutorial on using your die negative. I've used that trick since you told me about it. Super cute snowmen...love how you made them into Bag Tags! Your treat bag is so cute. Thanks for the recipe. Great tip! Very cute bags! Love your tags and the caramel popcorn! Your tags and treat bags are adorable. Nice job on the tutorial also. Love that adorable snowman on your cute tags! Thanks for the tips on the MISTI for lining up the die cuts and stamps too! Cute tags with excellent instructions. Will you make me some caramel popcorn? I know it will taste so much better if you do it. Love to meet another paper scrap hoarder. darling. the recipe sounds delicious. I love the way you've colored the snowman! Thanks for the caramel corn recipe too I bet that's delicious! Oops! Sorry about the question marks. Love your cards and the caramel popcorn recipe.